Found only in Fyrren's Wandering in Aggradar, Fyrren crystals are magically active crystals that radiate a kind of "magical static". This causes "friction" in the magical energies in the area. Spells will meet a certain resistance when cast in the area of fyrren crystals. This has the effect of reducing the overall strength of spells over time and severely limiting their duration. Spells that occur suddenly are not effected. However, spells that have a duration will be used up quickly. A spell that normally would stay in effect for hours would only last minutes. One that last days will only last hours and so on. Individual fyrren crystals have little effect, but the range is great and the effect is cumulative. 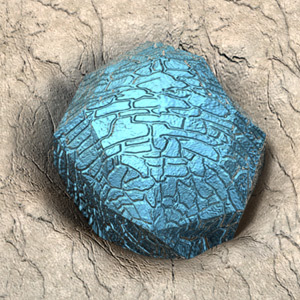 In Fyrren's Wandering, there are millions of these crystals embedded in the rock and scattered lose in the soil. Their combined influence can exert a tremendous draining effect on spells within the Wandering. It should be noted that shamans of the pugnar tribes dwell in the Wandering and, having spent years there, have adjusted to the fyrren crystals and can cast their spells normally. However, visiting wizards who are merely passing through the Wandering will be fully subjected to the effect. Fyrren crystals have some alchemical value and are useful to wizards in research, potion brewing and that sort of thing, but for the most part, fyrren crystals are not worth a great deal. Even so, some commoners in Magrakian and Aukarian that live near the border of the Wandering will sometimes venture in to gather crystals in hopes of selling them. Because of the rough, fractured surface of the crystals, they are usually not used in jewelry.